1 schoolroom (4 pieces to assemble). 1 teachers desk with manual pencil sharpener. 3 pcs of real chalk. 1 tape dispenser with 1 roll of clear tape. 1 heart shaped eraser, 2 pencil sharpeners, 1 box of 6 crayons, 6 markers, 1 black marker, 2 plastic pencil cases, 2 set of 4 index cards in a clear bag, 3 folders, 3 text books, 2 note pads, 2 copybooks, 1 certificate of achievement, 1 attendance sheet, 1 good behavior sheet, 1 set of loose-leaf paper in a clear bag, 2 star sticker sheets in clear bag, 2 apple sticker sheets in clear bag, 1 bag of rubber bands, 1 plant, 1 frame, 1 pair of glasses, 1 teachers mug, 1 box of tissues, 2 posters, 1 lunch box, 1 spoon, 1 pudding cup, 1 juice bottle, 1 Tupperware with vegetables and 1 lid, 1 butterfly sandwich, 1 apple, 3 storage bins and 2 recycling bins. Please Note: Dolls in photos are not included. We do not mark merchandise values below value or mark items as "gifts" - US and International government regulations prohibit such behavior. Stored in a smoke-free, climate-controlled environment. 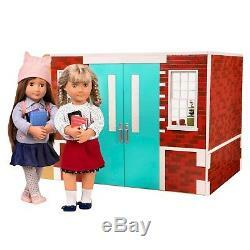 The item "Our Generation Awesome Academy School Room Set Fits American Girl Doll COMPLETE" is in sale since Tuesday, February 27, 2018. 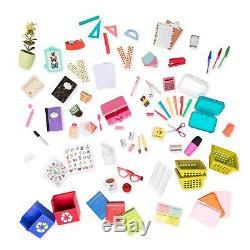 This item is in the category "Dolls & Bears\Dolls\Doll Furniture & Play Accessories\Modern Doll Furniture & Play Accs". The seller is "americandollcollector" and is located in Birmingham, Michigan. This item can be shipped worldwide.